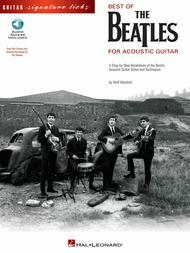 Best of the Beatles for Acoustic Guitar by The Beatles. For Guitar. Hal Leonard Guitar Signature Licks. Classic Rock, Britpop, Psychedelic Rock and Instructional. Guitar tablature songbook (song excerpts only) and examples CD. Guitar tablature, standard notation, vocal melody, lyrics, chord names, guitar chord diagrams and guitar notation legend. 79 pages. Published by Hal Leonard (HL.695453).ISBN 063401417X. With guitar tablature, standard notation, vocal melody, lyrics, chord names, guitar chord diagrams and guitar notation legend. Classic Rock, Britpop, Psychedelic Rock and Instructional. 9x12 inches.Learn the trademark acoustic guitar elements of rock's most influential band! This book/CD pack by guitar dean Wolf Marshall provides in-depth analysis of 21 songs.About Hal Leonard Signature LicksThe Signature Licks book/audio packs are especially formatted to give instruction on how to play a particular artist style by using the actual transcribed, "right from the record" licks! Designed for use by anyone from beginner right up to the experienced player who is looking to expand their insight. The books contain full performance notes and an overview of each artist or group's style with transcriptions in notes and tab. The audio accompaniment features playing tips and techniques, as well as playing examples at a slower tempo.